The Pensacola Blue Wahoos used more excellent starting pitching and late timely hitting on their way to a 4-3 win over the Jacksonville Jumbo Shrimp on Thursday evening at Blue Wahoos Stadium. 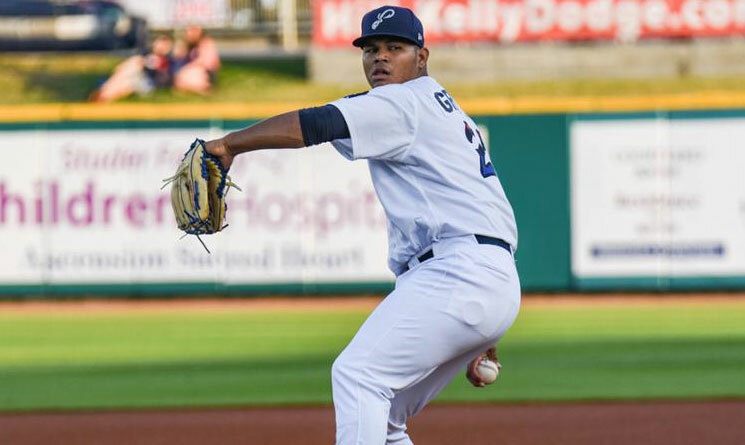 Brusdar Graterol, the top pitching prospect in the Minnesota Twins organization, showed off his 100-mile-per-hour heat while earning his first Double-A win, throwing 5.2 shutout innings and allowing just three hits while striking out four. In their first six games of the season prior to tonight, Pensacola’s offense has scored first in each contest. Tonight was no exception, as Jordan Gore led off the home half of the first with a single and came around to score following a single by Luis Arraez, a walk to Jaylin Davis, and an RBI base hit by Mitchell Kranson. With a one-run lead, Graterol locked into a pitching duel with the Jacksonville staff. Jumbo Shrimp starting pitcher Robert Dugger was knocked out of the game in the first inning when Arraez’s single up the middle deflected off his shoulder. Called into early relief, Kolton Mahoney and Parker Bugg combined to throw 5.0 shutout innings out of the bullpen, allowing just three hits while striking out four. After cruising through five innings, Graterol allowed a base hit to lead off the sixth. He bounced back by striking out the next two hitters, ending his outing with a 99-mile-per-hour fastball past John Silviano for strike three. As reliever Tyler Jay entered the game, Graterol left to a standing ovation from the home crowd. Jay stranded the runner in the sixth before allowing two runs in the seventh (only one earned). Clinging to a one-run lead, the Blue Wahoos pushed across an important insurance run in the bottom of the seventh. With Davis at first base and Gore at third and two outs in the inning, Jacksonville reliever Jeff Kinley attempted a pick off throw to first base. The throw drilled Davis in the shoulder as he returned to the bag and caromed away, allowing Gore to score from third and putting the Wahoos up 4-2. Jacksonville took a run back in the eighth, using a lead-off triple by Justin Twine and an RBI groundout to pull within one run. With the tight lead, reliever Dusten Knight recorded the final six outs to earn his second save of the year, preserving the win for the Blue Wahoos, and capping the night by doing his signature back flip on the mound. The win improves Pensacola’s record to 5-2 on the year, while Jacksonville falls to 3-4. The two teams will continue their five-game set at Blue Wahoos Stadium Friday.